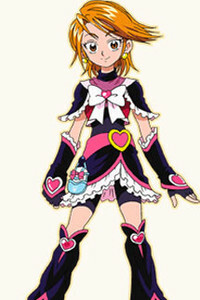 Misumi Nagisa( Natalie Blackstone in the english dub) is one of the main characters in the series Futari wa Pretty Cure. Because of her role as the narrator and the amount of attention she gets in the series, she is considered the main heroine. Her Pretty Cure ego is Cure Black (キュアブラック Kyuaburakku?). Although she was previously almost unaware of her existence, Nagisa eventually became best friends with Yukishiro Honoka because of their shared roles as Pretty Cure, admiring her for her intelligence, kindness and understanding. She has a habit of saying "arienai!" (ありえなーい！！ arienaai!!?) when she is upset, which can be roughly translated to "unbelievable" or "I don't believe this" and also "Lucky!" whenever things go her way. Although she is sporty, Nagisa is actually more girly and image conscious. She has a large collection of stuffed animals and is weak in academics, but makes up for it with pure spirit and energy as well as in lacrosse. She also has a large appetite and loves to eat chocolate and Takoyaki (Alex's doughnuts in the english version) and, according to Honoka, foods with the word "yaki" in the name. She likes shopping but tends to squander her money and ends up having none when she needs it most. She also loves playing on the grass and sunny days, and she hates fighting with her friends. Nagisa has a crush on Honoka's childhood friend, Fujimura Shougo, and gets flustered whenever he is around. To her dismay, Nagisa is more popular with the girls than the boys, and is sometimes shown to be jealous toward Honoka, who gets confessions and love letters from boys more than twice a month. Nagisa has a great sense of justice, but it is hidden inside of her and only comes out when someone is in danger. She hates that innocent people get hurt for things they had nothing to do with.